Meningiomas in this location arise from the flat segment of the sphenoid bone anterior to the chiasmatic sulcus within the anterior cranial fossa. Mortazavi MM, Mantovani A, Da Silva HB, and Sekhar LN F (2015). Olfactory groove and planum sphenoidale, and tuberculum sellae meningiomas In Sekhar LN, Fessler RG (second edition), Atlas of Neurosurgical Techniques: Brain. (pp. 227-237) New York, NY: Thieme Publishers. The tuberculum sellae is the bony elevation between the chiasmatic sulcus and the sella tursica. It is 2 cm posterior to the olfactory groove and lies within the middle cranial fossa. These meningiomas are most commonly associated with visual loss due to compression of the optic chiasm, causing bitemporal hemianopsia. Differentials on imaging may include pituitary macroadenoma. These tumors usually involve the optic canals and encase internal carotid and/or anterior cerebral arteries. They can encase the superior hypophyseal artery. They can breach into the sphenoid sinus. Surgical resection requires especial techniques including extradural resection of the anterior clinoid process on the side with most vascular encasement. After entering the dura, the falciform ligament of the ipsilateral optic nerve needs to be sectioned in order to let the optic nerve be mobilized and avoid optic nerve injury. The origin of the tumor at the tuberculum sellae needs to be drilled even if it would risk to open towards the phenoid sinus. Before resecting the tumor, the contralateral falciform ligament needs also to be sectioned in order to mobilize both optic nerves. Also, a majority of the tumors have extension into the optic canal and this technique gives access to resecting those extensions. Avoiding doing this, would not only risk putting tension on the optic nerves during resection of the tumor, but also risk leaving tumor residuals in the optic canals and risk of recurrence of the tumor. Once this important step is done, tumor needs to be dissected off potentially encased internal carotid artery and or anterior cerebral artery. Not unusually, we see the superior hypophyseal artery in the midst of the tumor. It needs to be dissected and saved. Central debulking is key here as the space surrounding the tumor is small and surrounded by both optic nerves, cerebral arteries and pituitary stalk. Once central debulking has shrunken the tumor, the entire tumor can be resected. If sphenoid sinus is opened, it can be filled with abdominal fat graft and covered with autologeous pericranium. Classification for surgical resection is proposed by Sekhar-Mortazavi1. Figure : Petroclival Meningioma. A. Axial T1-weighted MRI with contrast B. Axial T2- weighted MRI. C. Coronal T1-weighted MRI with contrast. D. Sagittal T1- weighted MRI. DiLuna ML and Bulsara KR. (2010). Surgery for petroclival meningiomas: A comprehensive review of outcomes in the skull base surgery era. Skull Base. 20(5): 337-342. There are many different tumors that may arise in the pineal region. They may be neoplastic or non-neoplastic in origin. These include tumors of pineal glandular tissue – pineocytomas and pineoblastomas; glial cells – astrocytomas, oligodendrogliomas, and glial cysts; arachnoid cells – meningiomas and arachnoid cysts; ependymal lining – ependymomas; sympathetic nerves – chemodectomas; germ cells – choriocarcinoma, germinoma, embryonal carcinoma, endodermal sinus tumor, and teratoma; and remnants of the ectoderm – epidermoid or dermoid cysts. Germ cell tumors are the most common mass type. Despite the diversity of tumor classifications, symptomatic presentation is similar. Obstruction of cerebrospinal fluid outflow through the aqueduct may cause obstructive hydrocephalus, with associated symptoms of headache and nausea and vomiting. Compression of the brainstem and cerebellum are possible. Due to vicinity of the tectum and the quadrigeminal plate, symptoms may include abnormal eye movements, such as the inability to look upward and diplopia, ataxia, and disequilibrium are among other symptoms. Endocrine dysfunction is a rare complication arising from disruption of pineal gland function and potential compression of the nearby hypothalamus. Symptoms may include diabetes insipidus, the inability to regulate water homeostasis, and slowing of growth in children and adolescents. Surgical resection of pineal tumors is preferred for management. Guidelines for treatments and outcome of pineal tumors were recently published1. Dermoid cysts are rare, benign brain lesions, accounting for 0.3% of all brain tumors. They are developmental tumors arising from early ectodermal tissue, and can contain keratin, cellular debris, hair, and sebum. They are most commonly located in the midline within the posterior fossa in adults and the lower spine in children and adolescents. They are associated with other congenital anomalies in up to 50% of cases. Dermoid cysts within the spinal tract typically have a dermal sinus tract draining to the skin and thus have high rates of recurrent bacterial meningitis. Complete surgical resection is the treatment of choice. Epidermoid cysts are also rare neoplasms, comprising 0.5-1.5% of brain tumors and peak at 40 years of age. Like dermoids, they too arise from early ectodermal tissue, but unlike dermoid cysts, contents are generally limited to stratified squamous epithelium, keratin, cellular debris, and cholesterol, with occasional hair. They are most commonly located in the cerebellopontine angle, fourth ventricle, suprasellar region, and spinal cord and are usually lateral. These are isolated lesions and may even occur iatrogenically following lumbar puncture in the lower spine. Very rarely do these lesions behave malignantly so as to destroy bone or degenerate to squamous cell carcinoma. Complications including aseptic meningitis and hydrocephalus may arise from cyst rupture. A rare variant of aspetic meningitis called Mollaret’s meningitis is associated with epidermoid cysts specifically. Complete surgical excision is first-line treatment, with care not to spill cyst contents. In comparison with Dermoids, Epidermoids are usually located laterally and Dermoids are more located medially. Pituitary adenomas are extremely common skull base lesions, constituting 10-15% of all intracranial neoplasms7. Whereas non-secretory pituitary adenomas are often clinically silent, secretory adenomas can cause various clinical symptoms related to the hormone produced7. Prolactin and growth hormone secretion are most frequently experienced, comprising 35% and 20% of all pituitary adenomas, respectively, but adrenocorticotropic hormone and thyroid-stimulating hormone production occur in some1,2. Medical management is possible, for instance dopamine agonists such as cabergoline and bromocriptine can be used to suppress prolactin secretion. Cabergoline is more effective than bromocriptine hormonally but is known to be associated with valvular heart disease and lung fibrosis. Should any sellar mass enlarge to a great extent, compression of the pituitary gland can produce hypopituitarism, while compression of the optic chiasm commonly results in visual disturbance. Compressive or hormone-related symptoms typically prompt surgical resection. Transsphenoidal surgery is the treatment of choice, with cure rates of approximately 85% for microadenomas, defined as being ≤ 1 cm in diameter, but lower for macroadenomas. Injury to the carotid artery is a serious intraoperative complication. Therefore, pituitary tumors with significant extension to the cavernous sinus and lateral to the internal carotid artery, or those with significant extension above the optic chiasm are proposed to undergo craniotomy alone or craniotomy in combination with endoscopic traanssphenoidal approach to minimize risk of injury to internal carotid artery and optic chiasm. Perioperative complications include hormonal disruption due to injury to the pituitary, especially diabetes insipidus secondary to alterations in antidiuretic hormone (ADH) secretion from the posterior pituitary3. This is typically transient. Recurrence of pituitary adenomas is about 12% within 4-8 years following surgery. Alvero R: Pituitary Adenoma, in F.F. Ferri, Editor (2017). Ferri’s Clinical Advisor 2017, Philidelphia: Elsevier, Inc.
Mortazavi MM, Suriya SS, Quadri SA, Khan MA, Hassanzadeh T, Adeeb N, Fard SA, Rezaee O, Tubbs RS. Current Concepts for Surgical Resection of Pituitary Adenoma: A Systematic Review with Meta-analysis. 85th AANS Annual Scientific Meeting, 22-26 April 2017. Sekhar L, Mantovani A, Mortazavi M, Schwartz TH, Couldwell WT. (2014). Open vs endoscopic: when to use which. Neurosurgery. 61(Suppl 1): 84-92. These are tumors that develop from residuals of Rathke’s pouch in the sella tursica. Rathke’s pouch is an embryological derivative of the oropharynx that develops into the anterior pituitary gland, or adenohypophysis. Craniopharyngiomas make up 2.5-4% of all brain neoplasms. Approximately 50% occur in early childhood, most commonly between ages 5-10 years. They are commonly located in the anterior superior margin of the pituitary, although some may arise within the third ventricle. These lesions generally have both solid and cystic components, including cholesterol crystals and calcifications. Large tumors can cause hormonal dysfunction due to compression of the pituitary gland. First-line treatment is surgical removal. Recurrence most often occurs if excision is not complete, typically arising less than 1 year following surgery. Mortality can occur from hypothalamic injury and hormonal dysregulation, but 5-year survival is about 55-85%. Radiation therapy for craniopharyngiomas is controversial with side effects of endocrine dysfuntion, optic neuritis, and dementia and should be avoided in pediatric patients. Most important aspect of surgical removal of these tumors lies in being very careful not injuring its posterior margin that not unusually is attached to the hypothalamus. Hypothalamus injury risks to affects patients water regulation and eating habits throughout their life. It is recommended to leave some tumor residual attached to the hypothalamus and bears a good neurological outcome rather than perform a gross total resection but have a patient with disturbed satiety center function who will be in a state of constant uncontrollable eating. A hamartoma is a malformation of cells found within the local region that resembles a tumor, but is not a true neoplasm. Hypothalamic hamartomas therefore rare, non-neoplastic congenital malformations originating from the inferior hypothalamus or tuber cinereum. The tuber cinereum is gray matter situated between the mammillary bodies and optic chiasm and a part of the hypothalamus. Hypothalamic hamartomas may occur in association with Pallister-Hall syndrome, which is caused by a defect in the GL13 gene. Seizures are the most common symptomatic presentation, especially gelastic seizures, which involve brief fits of unprovoked laughter. These seizures may degenerate into epileptic encephalopathy including complex partial seizures, drop attacks, and tonic-clonic seizures. Precocious puberty is another presentation due to release of gonadotropin-releasing hormone (GnRH) from hamartoma cells. These are the most common CNS lesion to cause precocious puberty. Developmental delay and behavioral disturbances are also possible. The pathology of hypothalamic hamartomas may be pedunculated (parahypothalamic) or sessile (intrathalamic). Pedunculated hamartomas have a more narrow base attached to the floor of the hypothalamus without distortion of the third ventricle. Sessile hamartomas have a broad attachment to the hypothalamus and arise from within the hypothalamus, distorting the third ventricle. Therefore, precocious puberty is more commonly associated with pedunculated hamartomas and seizures with sessile hamartomas. Precocious puberty can be managed medically with GnRH analogs, which suppress GnRH release. Anti-epileptics may be used to manage seizures. Indications for surgery are inadequate medical management or neurological deficit due to mass effect of the lesion. Risks of surgery include cranial neuropathy and stroke for pedunculated hamartoma resection and memory impairment, endocrine disruption, and weight gain for sessile hamartoma removal. Same principles of surgery as for craniopharyngiomas apply to this. Please see above. During surgical resection, it is important, not to injure the hypothalamus. Choroid plexus papillomas are benign, WHO grade I, tumors of the choroid plexus, which produces the cerebrospinal fluid (CSF) that surrounds the CNS. These are the most common type of choroid plexus tumor. Transformation to malignancy is rare. Choroid plexus tumors comprise 0.4-1% of all intracranial neoplasms. Seventy percent of those affected are less than 2 years of age. They are typically found supratentorially in children and infratentorially in adults (unlike most other tumors). The most common presenting symptoms are related to increased intracranial pressure from hydrocephalus including headache, nausea/vomiting, and craniomegaly (head enlargement). Hydrocephalus may arise either from overproduction of CSF or blockage of CSF outflow. Figure : Choroid Plexus Papiloma. A. Sagittal T1-weighted MRI with contrast B. Axial T1- weighted MRI with contrast. C. Sagittal T2-FLAIR D.Axial T2- FLAIR MRI. Vestibular schwannomas, also previously known as acoustic neuromas, are common, histologically benign tumors of the vestibulocochlear nerve (cranial nerve VIII) found in the cerebellopontine angle (CPA). Their name comes from their more common location arising from the inferior division of the vestibular nerve of cranial nerve VIII. They comprise 8-10% of all intracranial tumors with an annual incidence around 1.5 cases per 100,000 population. Symptoms arise generally after 30 years of age. Early symptoms include hearing loss (usually high frequency), tinnitus (high-pitched), and dysequilibrium. Hearing loss is insidious and progressive. Only 10% of patients experience sudden hearing loss. Larger tumors may cause facial numbness or weakness, headache, and focal brainstem signs including weakness. Workup for all patients involves brain MRI with and without contrast and audiometrics. Most vestibular schwannomas are unilateral. Bilateral vestibular schwannomas are characteristic of neurofibromatosis type 2 (NF2, discussed under neurosurgical syndromes). Radiosurgery and SRS better preserve hearing than microsurgery, especially for larger-sized tumors and in patients with greater preoperative hearing loss. However, direct cochlear nerve monitoring intraoperatively has improved preservation of hearing following microsurgery. In contrast, trigeminal neuropathy has a greater incidence with SRS, particularly for large tumors with high doses of radiation. This is not a common complication of microsurgery. Although the goal of surgery is total tumor resection, this may not be possible due to the proximity of the facial nerve. However, near total or subtotal resection both have excellent long-term tumor control with only observation or postoperative radiation. Facial nerve’s course, from its emergence form the brainstem, through its course within the temporal bone of the skull base and over the face has been classified by multiple authors. Surgery can be achieved through a Retrosigmoid craniectomy for all the tumors that do not have extension beyond the fundus segment of the facial nerve’s course within the temporal bone of the skull base1,2. If the tumor extension is lateral to the fundus, a middle fossa approach can be utilized. Postoperative complications include facial nerve damage, with inability to close the eyes; vestibular nerve damage, a common complication with nausea, vomiting, and potential long-term ataxia; lower cranial nerve deficits, with problems swallowing and risk of aspiration; and brainstem dysfunction, with ataxia and contralateral paresthesia. CSF fistula, rhinorrhea, meningitis, and stroke are also possible complications. CSF rhinorrhea is the most common surgical complication, occurring in 4-27% of cases. This may resolve on its own (25-35%) or require surgical re-exploration and shunt placement. Hearing loss has been found to be worse with retrosigmoid than middle fossa craniotomy, even when controlling for tumor size3. Preservation of functional hearing after gamma knife radiosurgery is high with 49% of patients in one clinical trial retaining functional hearing at 10-year follow-up4. Tubbs RS, Fries FN, Kulwin C, Mortazavi MM, Loukas M, Cohen-Gadol AA. (2016). Modified skin incision for avoiding the lesser occipital nerve and occipital artery during retrosigmoid craniotomy: potential applications for enhancing operative working distance and angles while minimizing the risk of postoperative neuralgias and intraoperative hemorrhage. Journal of Clinical Neurosurgery. 32:83-87. Wilkinson EP, Roberts DS, Cassis A, Sochwartz MS. (2016). Hearing outcomes after middle fossa or retrosigmoid craniotomy for vestibular schwannoma tumors. J Neurol Surg B Skull Base. 77(4): 333-340. Boari N, Bailo M, Gagliardi F, Franzin A, Gemma A, del Vecchio A, Bolognesi A, Picozzi P, Motini P. (2014). Gamma Knife radiosurgery for vestibular schwannoma: clinical results at long-term follow-up in a series of 379 patients. Journal of Neurosurgery. 121 Suppl: 123-142. Figure : Trigeminal Schwannoma. A. Axial T1-weighted MRI. B. Axial T1-wieghted with contrast. C. Sagittal T1-wieghted MRI with contrast. Ramina R, Mattei TA, Soria MG, da Silva EB, Leal AG, Neto MC, Fernandes YB. (2008). Surgical management of trigeminal schwannomas. Neurosurgical Focus. 25(6): E6. Glomus tumors, also known as paragangliomas, are rare neuroendocrine neoplasms arising from paraganglion cells of the neural crest. Ninety-seven percent are histologically benign with most showing slow growth. Most are located in the abdomen (97%), with only 3% located intracranially. Some may secrete catecholamines, which can cause life-threatening hypertension and/or cardiac arrhythmias. Up to 50% are inherited, with the rest being sporadic. Most of them are sensitive to radiation as the main treatment or in order to shrink the tumor for resection of a smaller residual. Some glomus tumors can be observed or managed medically with alpha- and beta-blockers as needed for hormone secretion. For those that require resection, surgery has usually been first-line but the advent of radiosurgery has provided an alternative. Studies have shown good tumor control with low risk of cranial nerve injuries following gamma knife radiosurgery1-3. Chen PG, Nguyen JH, Payne SC, Sheehan JP, Hashisaki GT. (2010). Treatment of glomus jugulare tumors with gamma knife radio surgery. Laryngoscope. 120: 1856-1862. Jacob JT, Pollock BE, Carlson ML, Driscoll CL, Link MJ. (2015). 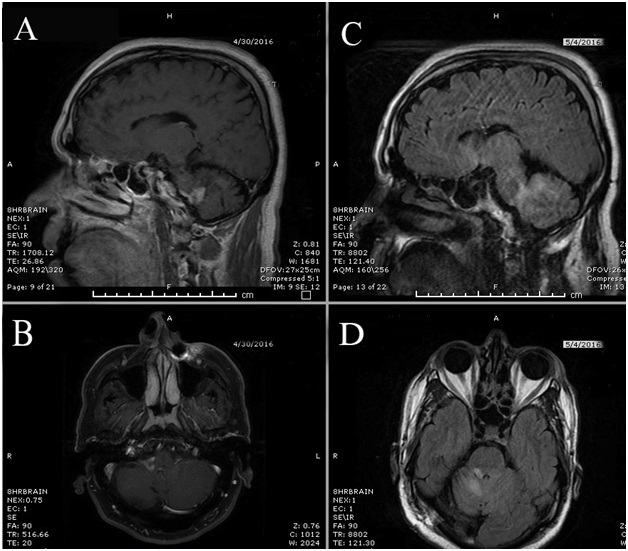 Stereotactic radiosurgery in the management of vestibular schwannoma and glomus jugulare: indications, techniques, and results. Otolaryngol Clin North Am. 48(3): 515-526. Sanna M, Piazza P, Ho Shin S, Flanagan S, Mancini F.(2013) Microsurgery of Skull Base Paragngliomas. New York, NY: Thieme Publishers.